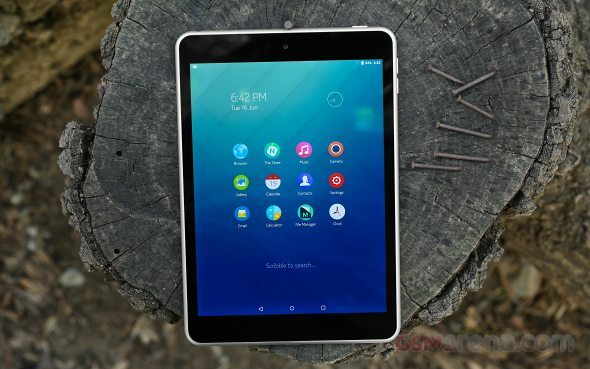 The Nokia N1 is an Intel-powered tablet, the Atom Z3580 chipset specifically. ARM-based devices are more common, but the Atom brings four 64-bit enabled CPU cores at 2.3GHz and a PowerVR G6430 GPU (same GPU as the iPad mini 3). They are hooked up with 2GB of RAM. The processor is fairly capable, Geekbench 3 places it on par with an octa-core processor in the Galaxy Tab S 8.4 (Exynos 5420) or a quad-core Krait 400 in the Xperia Z3 Tablet Compact (Snapdragon 801). Nvidia's Tegra K1 chipsets, both of them, have a solid advantage. The HTC-made Nexus 9 uses the Tegra K1 with a dual-core Denver processor, which doubles the performance of the Atom cores both individually and as a group. The Tegra K1 in the Xiaomi Mi Pad 7.9 uses four Cortex-A15 cores and is quite fast too. Full-system performance falls between the common Snapdragon 80x tablets like the Xperia Z3 Tablet Compact and the beastly Nexus 9. Moving on to gaming performance, the iPads have proven the GPU is solid, especially at the 1,536 x 2,048px resolution. On-screen tests show playable frame rates on the older GFX 2.7 benchmark, though bleeding edge titles will not run at their max at full resolution. Games optimized for the iPad will be pretty easy to move over to the Nokia N1 and run at the same speed/graphics level. The raw GPU performance has been outshone by Nvidia's mobile Tegra GPU so a Nexus 9 or Nvidia's own Shield tablet will make a more serious gaming platform. Still, performance is comparable to an Adreno 330, which is quite popular on phones and tablets. Note that both the Nexus 9 and Xiaomi Mi Pad 7.9 render screen content at the same resolution as the Nokia N1. Full web page rendering isn't hindered by super high resolutions and you can expect an experience similar to a Galaxy Tab S 8.4 or an Xperia Z3 Tablet Compact. The Nexus 9 pulls way ahead, while the Xiaomi Mi Pad 7.9 lags behind. The Nokia N1 offers good all-round performance for the upper mid-range market. Newer chipsets in phones are outpacing it, but those will take a while to trickle down to this price range. Nvidia currently rules the gaming market, but that aside popular compact tablets do not offer better performance for apps, games or browsing.